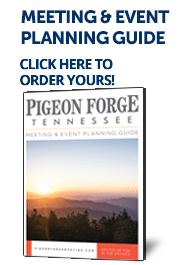 Pigeon Forge is ready to host your business meeting, convention or trade show. With more than 145,000 square feet of meeting and exhibit space in 20 different venues, you’ll have access to big city amenities with small town charm. Several of our theaters are available for use as corporate meeting spaces. Plus there are more than 12,000 sleeping quarters, so your attendees will have plenty of room to rest and relax. There are also several hotels with conference facilities. Call us at 865-429-7432 or email us at info@lecontcenter.com for more information.